Residents of Nakaloke town council in Mbale district turned violent and blocked the Mbale-Soroti highway after the Ambulance of the ministry of health Reg No Ug3651M from Atuturi general hospital of Soroti district knocked and killed one Bodaboda rider. The deceased was identified with one name Jimmy who has been riding at Kawangasi road stage found in Nakaloke. This incident took place on Monday 1st April, 2019 in Nakaloke trading center at around 3pm. Police led by the new district police commander reached the scene in time and cooled down the rowdy crowd. Juma added that luckily all the people in the ambulance were saved and they were rushed to Mbale main hospital. 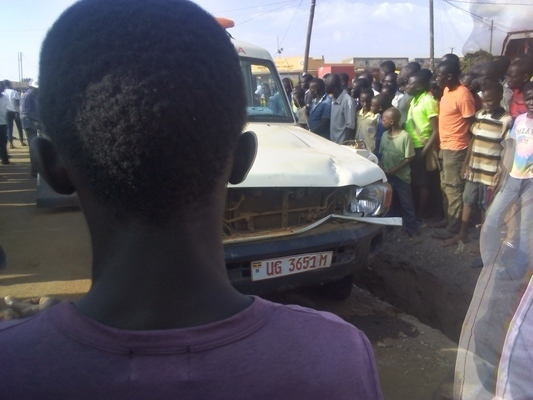 Isma Obbo another resident of Kireka village who was at the scene during the accident said that all this happened due to lack of road humps on this road. “On this road we lack humps so drivers just just speed because there is nothing to control them”. Kadama Yusuf the youth councilor of Nakaloke Sub County called upon the government to install the much needed humps on this road to curb accidents. Last year an accident at the same spot claimed the life of the LC1 which made residents to demonstrate demanding for the humps which government has failed to install so far. “May be the government wants to see all of us dead in this place before they put humps on this road this place is busy, full of schools and it is highly populated but cars move at very high speeds.” one resident lamented. The district police commander promised to work on the instalation of humps as demanded by the locals. The police report of 2017 indicated that 13224 accident cases and 461 were from over speeding. The same report indicates that 4445 motorcyclists and motorcyclist users at least obtained serious injuries in road accidents in 2017.